The community came together on Xmas day to help share the festive spirit. On Xmas day, Hillsong Church in Bermondsey invited locals to help provide a wonderful experience for all on the 25th December. Just under a hundred care leavers, young people in care and refugees came together to share the festive spirit. Top chefs were at hand to help prepare a delicious Christmas lunch, with lots of fun throughout the day including board games, Christmas movies and other activities. At the end of the day everyone was presented with a bag of gifts personally put together for them from community donations. Tara Taylor from Beckhams Property Services was one of the Volunteers who helped to host the event. She explains, “it was one of the most magical experiences ever, seeing so many happy faces, making new friends and sharing Xmas with many who do not have a family to be with over the Festive period”. Tim Lund, who lives in Lewisham and is passionate about the community, details how neighbourhoods can work together to create a positive environment. He explains, this is an argument for a scalable initiative to support volunteers who want to make their neighbourhoods look better. In summary, there should be some high quality, consistent but adaptable branding, to identify volunteer initiatives, and support communications with and about them. The initiative would be owned by a professional managed organisation, ideally operating at a national level. He continues to detail, on a short walk into Forest Hill, SE23 this morning, I passed several spots where volunteers are trying, or have tried, to do something to make their neighbourhoods look better. One thought in setting off was to prospect a location where the chair of the Forest Hill Society Environment committee has suggested I do some planting myself. 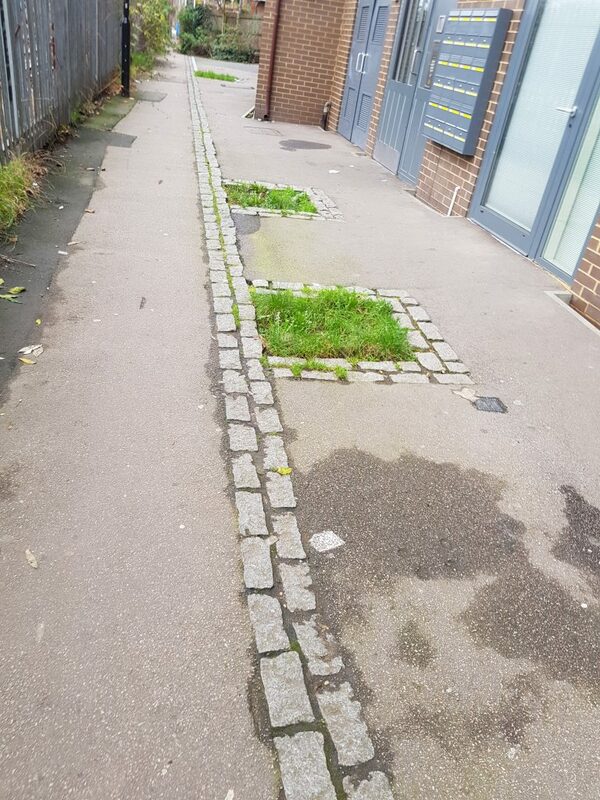 I was wondering, if I did, whether there should be some signage to say what was going on, maybe attached to the railings on the left, or the brickwork on the right, if Network Rail was going to be difficult. Most of the places I passed had no signage, but others did, although the standard was a bit variable. So here are some thoughts about how what that signage should be, and how it should work, with illustrations from my morning walk. The overriding purpose of any signage should be to support the initiative to make the neighbourhood look better, so straightaway we can say it would need to look good, and last. Signage such as this, printed on paper, then laminated and pinned is OK as long as it is removed or replaced when it starts to get wet, or is vandalised, but that cannot be depended upon. Although I’d say the most important one is the implicit one, identifying the initiative with the community group responsible for it. 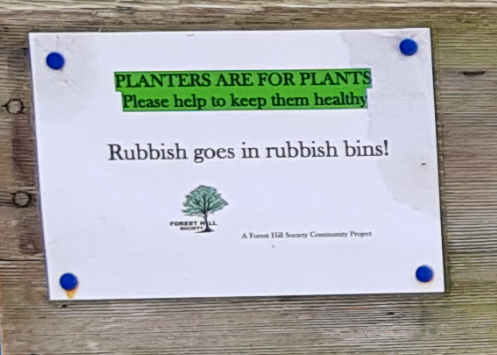 That works both by giving kudos to the Forest Hill Society, and helping anyone who wants to get in touch with them, either just to say ‘thank you’, to help with this initiative, or to get involved with other things done by the society. However, I also passed another Forest Hill Society initiative without any signage, which I’d say was an opportunity missed. 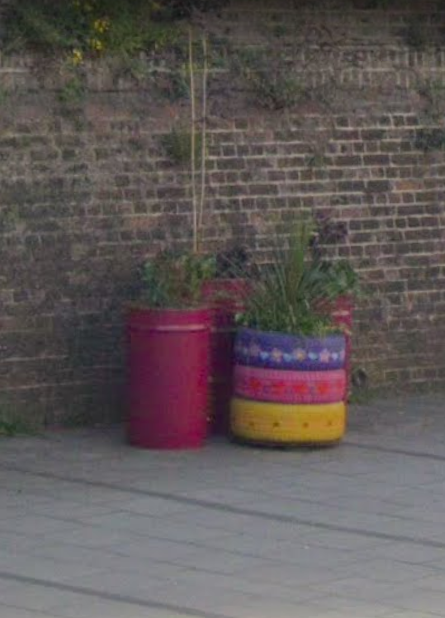 It’s possible this was because there wasn’t the problem with people using these as litter bins, or more likely that it was harder to fix a notice anywhere. 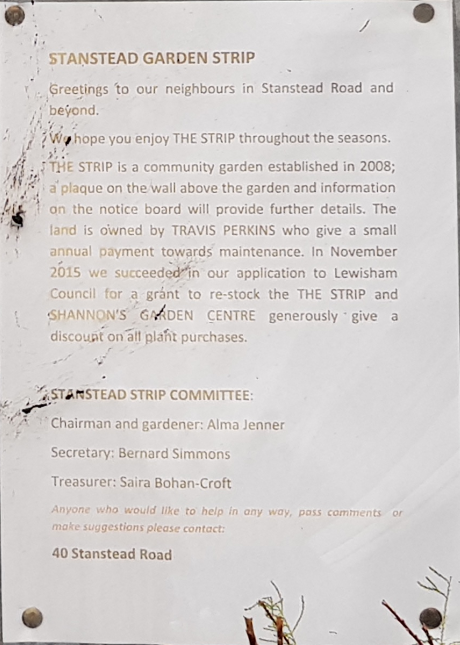 There’s lots of good information here, including recognition of local businesses who support the volunteers, but it is still years out of date, and includes people’s names, and a street address, which normally people wouldn’t want made public. 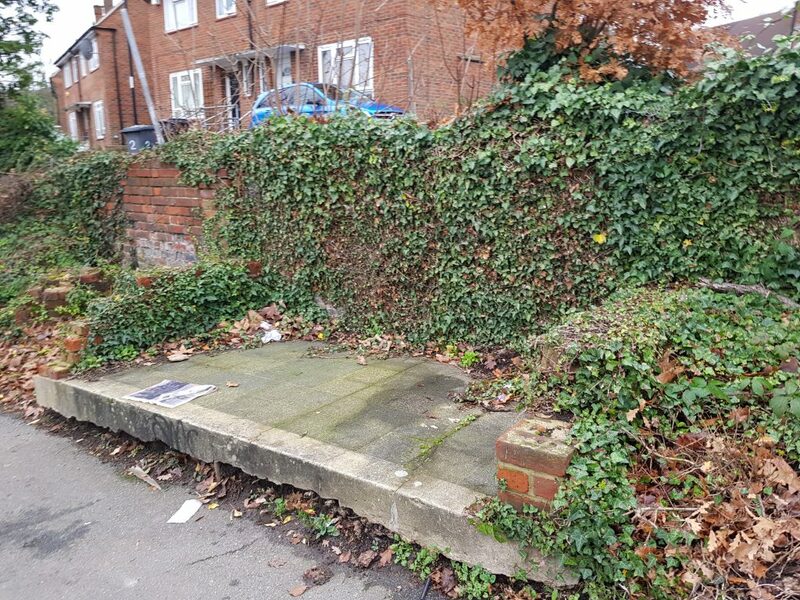 Here are a couple of other locations I passed, one where the volunteer has given up, because the bench she put here got vandalised or stolen. I’ve no idea who started off planting this other, a manky old rose bed, but having seen someone else just getting on with things, I too started planting in it. 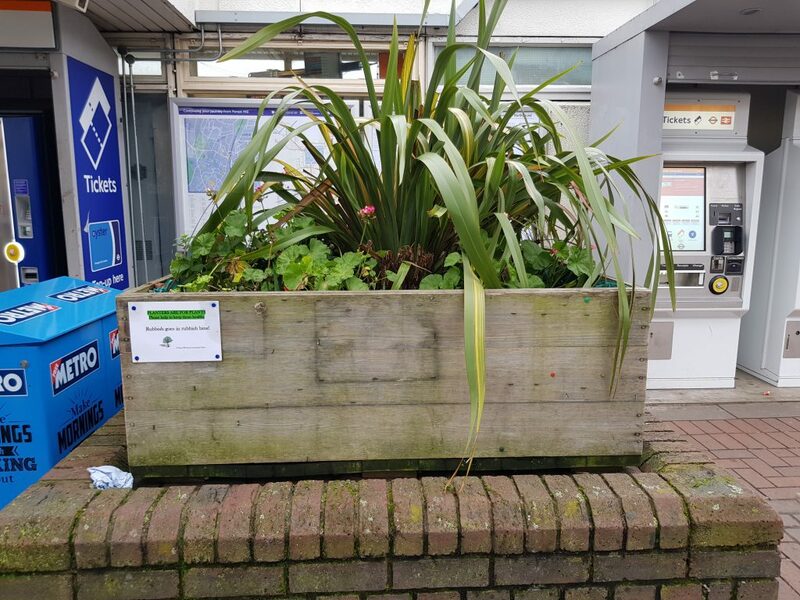 It gets a bit of littering, but not that much, and the plants don’t get vandalised, so I can say that this sort of thing can be a good positive experience. There is no signage, however. Finally there is this signage, for a bit of open access land*, which does get graffiti’d, although the signage is still there. Special as I think SE23 is, and however much I support the Forest Hill Society and other local community groups, I know there will be similar groups and individual volunteers all over the country. Wherever they are, there will also be hard pressed local authority officers, and councillors, trying to do what they can for their neighbourhoods, and looking to support and encourage such volunteers, with what few resources they have. 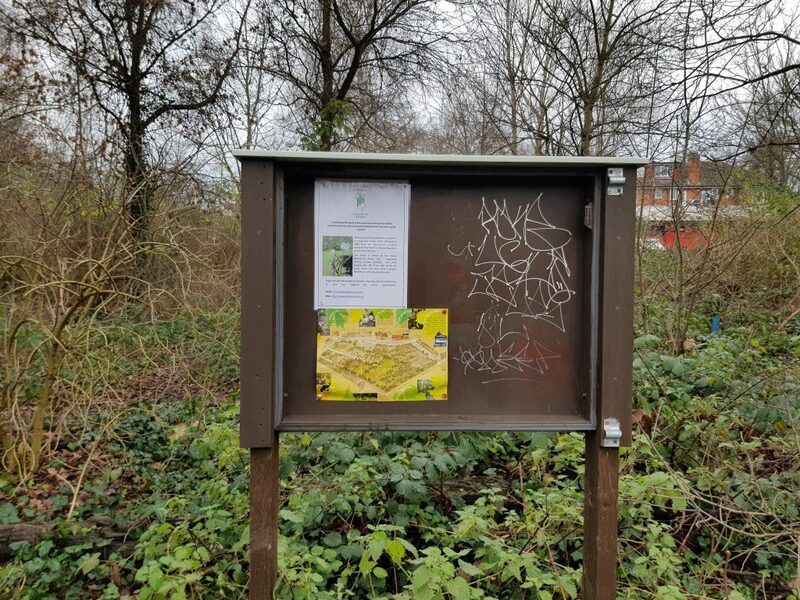 In all cases, there will be some need for communications, so the key recommendation is for some robust signage which can be affixed at or near a volunteering site, with branding to say “this space is maintained by local volunteers”, and an idea for the site. This could just be a number, although with GPS locations available on modern phones, even this might not be necessary. By submitting a photograph of the site, or equivalently sharing its location, it would be possible to find out, or ask for information about the site and its current management, with as much or as little information volunteered as the volunteers want. An active community group, such as the Forest Hill Society, would generally want their name to be known, and could have their own logo added to the signage. The “professionally managed organisation, ideally operating at a national level” envisaged in the opening summary, as well as owning the brand, and arranging for the installation of signage, would also be the database owner, and need to maintain contact details, as much as possible, for the relevant volunteers. This will not always be up to date, or even known, and similarly, owners of land or their agents may not be known, but neither possibility should be a show stopper. In fact, it could be how a land owner discovers, discretely, who is doing something on their land, if the volunteer wishes to be identified at all, while for a volunteer, it could be a way of finding out how the owner is, and offering them a means of contact, if that is what the volunteer wanted. It’s tempting to minimise how much this would cost, so rather than argue that it would certainly be possible to finance this, it’s safer to argue for funding to assess how much it would cost, who might pay for it, and who would do it. The branding would be a one off cost, so is unlikely to be critical, especially if an existing organisation’s brand, as project owner, could be used. The cost of producing and installing the robust signage suggested will be more critical, and a study would be needed of the range of possible materials in which it would be needed, and how installed, based on an initial survey of possible sites. There would then be the task of identifying actual sites and telling people what the signage signified, and following on from that, the task of maintaining the database of sites, volunteer contacts, and owners / managers. That would be a task for someone with experience of working with local authorities and community groups. However much local authorities might like the idea, they are unlikely to have the budget to pay for them. More likely, therefore, some combination of central government (MHCLG) funding, grant making body, for initial studies, and on going commercial sponsorship, in return for logos appearing alongside the brand owner’s, on the signage. The first organisation which occurred to me as a possible owner was Groundwork UK, “working across the UK helping communities find practical solutions to the challenges they face.”, but doubtless there are others. Tim frequently blogs about the community, to follow his updates, please visit his website. You can also follow him on Twitter, by clicking the following link. After actively engaging on Twitter for 6 weeks, Beckhams Property Services have established great community relationships, today celebrating their 600th Twitter follower. Lewisham continuously demonstrates why it is a great place to live, as locals rally together to support local businesses such as Beckhams Property Services. Much of the engagement has come naturally from health and safety, construction and real estate professionals across the globe, but more surprisingly the amount of interaction from local forums and residents of Lewisham, Southwark and Bexley has been exceptional. Beckhams Property Services is based in SE26, Forest Hill, but sits on the South Circular Road going towards SE6, Catford, neighbour to SE4, Brockley and SE26 Sydenham, all with-in the London Borough of Lewisham. Before opening Beckhams, Business Services Manager Tara Taylor had no idea how to use Twitter and it seemed like an alien concept, but with the guidance of local users, she’s now become addicted to posting about the business and community. Using an informal approach to the social media platform, the community welcome has been very unexpected and warming to say the least. Operating in the London Boroughs of Bexley, Bromley, Lewisham and Southwark, Beckhams Property Services is a South East London based, tailor-made Property Consultancy with customer service at its core. Highly knowledgeable in all aspects of the Commercial and Residential property markets, Beckhams specialises in working with Clients seeking an experience different to what they would receive from a traditional high street Estate Agent. Beckhams are committed to deliver exceptional levels of customer service to all of our Clients, whether it is in relation to Estate Agency property Sales, Lettings & Management or Houses of Multiple Occupation (HMO), Health & Safety, Maintenance & Construction or Property Conversions, in addition to providing advice on increasing a property Owner’s returns on their investment. 2018 has been a busy year for all, with many looking forward to the fresh start that 2019 has to offer. This could include starting a new business, forming new relationships, starting a new job, moving or even buying a new home. At Beckhams Property Services, we hope that whatever you choose to do, that you have an amazing 2019 and end 2018 on a high. Our team love the community we live and work in, recently engaging in a number of public events, including the Catford Food Market where we were lucky to get our hands on some art by local artist Jane Tillin. She takes everyday images from South London, transforming these through the print making process using an array of richly pigmented inks, which is a wonderful thing. Producing lino prints and cards, she uses a reduction printing process which means that every print is unique and a limited edition. A teacher by profession, she also enjoy running workshops and enabling others to enjoy the printing process. We will be volunteering on Xmas day to help ensure children whose parents aren’t around, to have an amazing day. Events have not only enabled us to build a relationship with our local community, it has helped to increase our creativity. We have subsequently seen our business grow organically, plus we’re having a go at innovating, which we enjoy. We view our agency as remarkable and we drive everything we do with excellence in mind. On our way to become market leaders, a journey we know we’re still on, we’ve understood that we need to care about the culture we foster and thus we have chosen to set standards, that it is important to make it clear to our staff and clients that we believe the best in them, we want the best for them and we expect the best from them. We look forward to meeting all of our new Clients in the New Year and wish you the best as always. To keep up to date with our news and community events, sign up to our Newsletter, where we can send you information on this, or similar community events which may be of interest to you or others you know. As well as food, there’s live music, free craft events for children and Catford Cornucopia – Catford’s very own gift shop. The Beckhams Property Service’s will be in attendance to try out the delicious foods, plus buy some local food and hopefully buy some locally produced art for our new office on Stanstead Road. The market has excellent accessibility for pushchairs and those with mobility needs or who just want some seating. Organised separately from the Catford Market, with the Food Market taking place on the last Sunday of every month, it features handmade cosmetics, coffee with a conscience, street food from around the world, local crafts and ingredients for any kitchen. The market is a short walk from both Catford and Catford Bridge stations or the surrounding areas. Catford Broadway is a wide flat street with minimal kerbs and as such is accessible for wheelchairs, buggies and shopping trolleys. The Catford Food Market will have its own custom seating areas for you to stop and take the weight off your feet while you eat. I love what you are doing. How can I promote Beckhams and the Catford Food Market? You can promote both Beckhams Property Services and the Catford Food Market by social media. We are both on Twitter and Instagram and you can use the hashtag #catfordfoodmarket and #beckhamspropertyservices. We follow back and we love to see your photos of Lewisham, Catford and the Catford Food Market so @ us both in! To keep up to date with news like the Catford Food Market, as well as other community events, sign up to our Newsletter, where we can send you information on this, or similar community events which may be of interest to you or others you know. New Bermondsey features an underused 30-acre industrial site, which tips the London Borough of Lewisham, home of Beckhams Property Services. The development will help to create Lewisham and Southwark’s newest community, attracting its own unique identity. The development will see new people moving into the area, owing to the creation of new homes and job opportunities, as well as the new community spaces that will naturally come as part of the scheme, helping to bring a fresh lease of life to the community. The regeneration specialists at Renewal have closely worked with Lewisham Council and the Mayor of London for this project, you can find heaps more information on their website www.newbermondsey.com. The project will consist of two phases, the first will create a local community hub, with coffee shops, rehearsal and classroom space. The second phase of the project will include the development of 271 homes as well as Energize, a new state-of-the-art £40m indoor sports complex. In partnership with OnSide to create an OnSide Youth Zone within Energize, the scheme will provide young people with a space to meet, creating things to do and people to talk to. To keep up to date with developments such as the New Bermondsey Project, as well as property Homes and Flats for rent or sale, sign up to our Newsletter, where we can send you information on this, or similar community schemes which may be of interest to you or others you know. This show was special, as it marked the 40th show for the event organisers. Proving popular as always, the show has become a favourite amongst seasoned entrepreneurs, as well as those testing their feet in the waters of setting up and running their own business. Tara also met her account management team from Yell, who are invaluable to the business and always go above and beyond in their service delivery. If you require further information about our unique business marketing strategies and systems, please sign-up to our website for free, call, email or visit our office, where we’ll be happy to discuss in further detail with you. Properties in Brockley, Lewisham are considered the next step in the chain for those wishing to move out of Shoreditch. You only have to walk around Brockley to see for yourself the buzzing streets, parks, neighbourly shops and restaurants. Identified as part of the postcode SE4, Brockley neighbours Crofton Park, Ladywell and Forest Hill in Lewisham and owing to it’s quirky nature, is seen as the Auntie to Shoreditch, which is currently undergoing its own significant regeneration and modernisation programme. Many London residents bored with City life, in places such as Shoreditch see Brockley as the next step in their property ladder. Lewisham is familiar in scenery, without the hustle and bustle of the daily grind of being in the hub of London. This district has been designated a conservation area by the Heritage Conservation Authority and is home to the Brockley Conservation Area. Since 1974, this Association has managed to designate this area as protected, in order to retain its identity and character. As such, very few new buildings have been built there in recent years and the site has kept it’s tree-lined streets and Victorian terraces. Brockley contains several attractive open spaces, amongst them Blythe Hill, Brockley and Ladywell Cemeteries (opened in 1858 and now a nature reserve) and Hilly Fields. The latter was saved from development by the Commons Preservation Society and local groups in the 1880s and 1890s (including Octavia Hill, one of the founders of the National Trust). In 1896, after being bought with the proceeds of private donations and funding from the London County Council, the fields were transformed from old brickpits and ditches into a park. The park became a regular meeting place for the Suffragette movement between 1907 and 1914. Property for sale in Brockley falls below the London average pricing scale, as it is still undergoing major regeneration; therefore proving a popular choice for first time buyers and investors alike. For transport, there are three overland railway stations, Crofton, Ladywell and Brockley stations, as well as buses with direct access to Victoria, Lewisham and London Bridge. These options prove a popular choice for City workers, who want to live in leafy suburbs, whilst maintaining their City lifestyle. If you require further information regarding buying properties in Brockley, please sign-up to our website for free, call, email or visit our office, where we’ll be happy to discuss in further detail with you. Why not sell your home in 2019 with Forest Hill’s most passionate Estate Agency, Beckhams Property Services. Brexit had a massive impact on the housing market, with many prospective sellers choosing instead to stay put. However, with 2019 offering more stability with a structured conclusion on how Britain will leave the European Union, more Home Owners are now confident in discussing the future sale prospects for their home. Beckhams Property Services, based in Forest Hill, Lewisham, have seen many enquiries from buyers, but not enough stock on the market. Could you be missing the chance to meet your perfect buyer? If you’ve been fortunate enough to find your dream house, now’s the time to pounce on it. Fewer properties are likely to come on the market in the current climate so if you see something you like and you are confident you can find a buyer for yours, go for it. If you’ve made the decision that you’re going to move regardless of what the future of the British economy holds, now’s the time to do it. After Brexit, things are likely to get more expensive and harder, especially for visas, plus you may be able to grab a bargain if seeking to move up the ladder to a different location. Our team offer a free valuation service, with competitive fees, no money paid until completion and Lewisham born and bred property experts. We know what our community requires when it comes to service, plus treat our Clients with the respect, due care and attention they rightly deserve. If you would like to discover what your home is worth in todays market, so you can consider if you would like to put it on the market, why not speak to a member of our Team who can help you to decide if you would like to join those who place their home on the market in January, so that you can move onto pastures new.. Contact a member of our team today, to sell your home in areas such as Forest Hill, Lewisham, London, or Catford, SE6 with Beckhams Property Services, your local Independent Estate Agency.